February 25, 2014: Global discussions on the post-2015 agenda are gaining momentum as the current Millennium Development Goals are approaching deadline. In view of the current global health challenges, the Action for Global Health (AfGH), together with The Western and Central African Regional Network (REPAOC) of NGO Platforms realized the need for clarity on the ways in which UHC could be defined and implemented by national and international governments in the post-2015 framework. 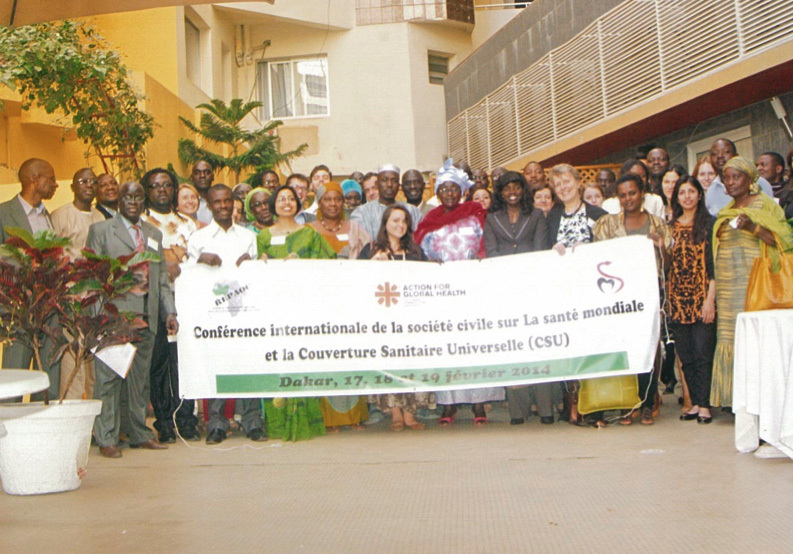 The two organizations therefore, co-hosted the Civil Society Organization (CSO) Conference on Global Health and Universal Health Coverage workshop in Dakar, Senegal on February 17-19, 2014 where global CSO participants from 33 countries were invited to drive the debate and conclude with a joint declaration (soon to be in the public domain) on the right to health and on universal health coverage (UHC) as an instrument to achieving this right. Our Senior Research & Communication Associate, Mariam Malik represented Heartfile at this convention. February 21, 2014: Choked Pipes – Reforming Pakistan’s Mixed Health System, our 2010 Oxford University publication delves deeply into health systems strengethening, especially in developing countries’ context. Given the global interest in the content, Heartfile is hence undertaking for direction an informative documentary based on it under its Health Systems Strengthening Project. Visit here for more details. 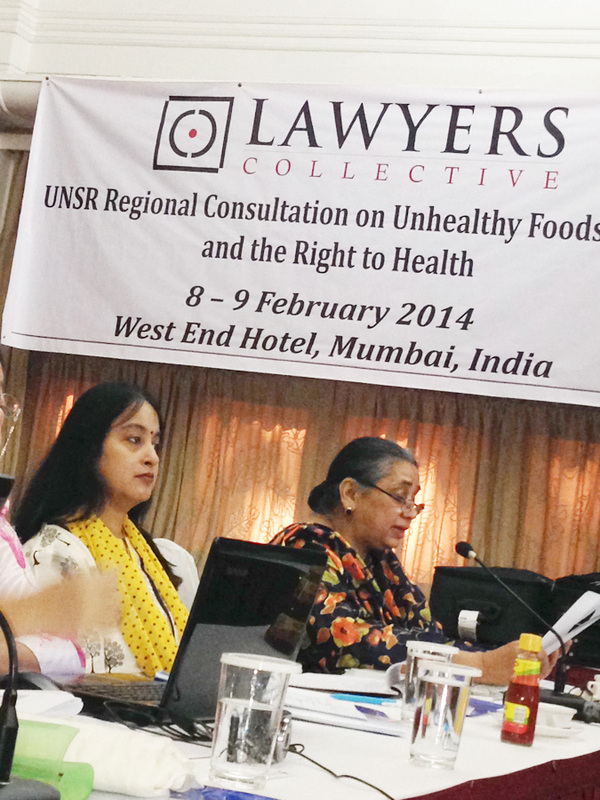 February 17, 2014: Mr. Anand Grover, the UN Special Rapporteur on the right to health, held a regional consultation for his next thematic report to the UN Human Right Council on unhealthy foods, NCDs and the right to health in Mumbai, 8-9 February, 2014. The meeting brought on a common platform, participants from South and South East Asia to dialogue and debate on the themes and identify key concerns and issues in the region with respect to unhealthy foods, their link to NCDs and the implications for the right to health. Mariam Mehdi, Senior Volunteer, represented Heartfile and made a presentation on NCDs and Health Systems focusing on Pakistan’s experience and the engagement of Heartfile in the process of bringing NCDs on the national and global agendas. February 14, 2014: Discussions on the empirics of governance and corruption are limited in conveying the real impact of poor governance at the granular level—a level, which can indicate the quantum of human suffering as a result of poor governance and corruption. The health sector is deeply impacted as a result of entrenched corruption. This week we post a true story of a family afflicted by corruption on our eForum Blog with a view to raising awareness about four key entry points to anti-corruption reform in Pakistan. These have been cross posted in The News International and the Huffington Post. Corruption is not just a cost; it is a curse that deeply affects individuals as well as the state system. It is the single most important obstacle to economic growth and development. It is devastating for investment and growth on the one hand, and denies the poor of equal opportunity and basic services, on the other. We seriously underestimate the costs of corruption. The story of a family published in Part 1 of this comment – which led readers to communicate several other similar examples to this writer – is one aspect of the suffering it unleashes. But more than the plundering, pilfering, and mistargeting of resources, corruption and collusion also weaken the social fabric, undermine the safety of our population, and risk national sovereignty, threatening peace and security. As an indicator, control of corruption is highly correlated with improvements in development outcomes. Unfortunately, as opposed to this evidence, corruption control has not been high enough on the political agendas of successive governments. Conversely, one of the most critical mistakes most governments made in tackling corruption was to go straight for punitive action, which does not provide a sustainable solution. The key is to focus on building institutions and systems that limit opportunities for collusion, graft, and arbitrage in the first place. Viewing the problem through the narrow lens of financial corruption is the second mistake. Ethical and procedural collusion can be equally damaging. Corruption can either be an economic response to low incentives in the public system or a manifestation of state capture, which is the result of vested interests of the elite. The central thread to addressing both is the creation of systems of accountability and oversight, which need to be at the heart of anticorruption reform. Comprehensive anticorruption reform necessitates a long list of structural and institutional governance changes. A fresh consensus is needed on the national anticorruption strategy. A long list of anticorruption agencies involved in public redress, oversight and investigative work need to be depoliticised and strengthened – National Accountability Bureau, FIA, Ombudsman’s office – with attention to several laws and norms. Integrity is the bedrock of good governance, but structural ways of ingraining that through systems of compensation, hiring, promotions are an imperative. More broadly, integrity and transparency-promoting measures need to be institutionalised within the state system dealing with policymaking, regulation, and oversight. But measures such as these are time-consuming and need sustained incremental action across the tenure of successive governments. Even with committed action, corruption cannot be rooted out in a big sweep. The initial strategic entry points, therefore, assume importance in this respect. Four points are being outlined in this regard. These have the potential to bring about broad-based impact towards transparency. These steps are not resource-intensive; on the contrary, they are practical measures that can be taken today. The first step is attention to conflict of interest, which is a situation ‘that has the potential to undermine the impartiality of a person because of the possibility of a clash between the person’s self-interest and professional interest or public interest’. In the affairs of the state, conflict of interest matters deeply and is one of the key ethical questions in governance. Ministries and their related departments are institutions where safeguards against conflict of interest and the need for transparency and accountability of decisions matter the most. However, as opposed to this, rules regulating conflict of interest are not explicitly defined in the government of Pakistan norms. The ‘code of conduct for ministers’ alludes to the need for separation, but exact modalities are not defined in a binding instrument. As a result, policymakers could have business relationships in sectors where they are charged with policymaking responsibilities, raising conflict of interest concerns. These need to be actively regulated and managed. A concrete set of binding principles and better framing and implementation of conflict-of-interest norms is needed so that the space for policymakers to have business relationships can be narrowed, and public officials have explicit clarity on how personal interests need to be subservient to public interest. Second, the use of existing transparency-enhancing instruments of governance should be promoted. The word ‘use’ and not ‘develop’ has been consciously chosen here, as successive governments have invested, over time, in a number of instruments and systems that can be governance-enhancing, but which remain underused. For example, the government’s e-office suite, which is a customised application for management of the government’s current filing system, has existed for several years. It has met all the scrutiny criteria, including audit, and was previously used by many ministries and attached departments. Not only can this system make the government’s process of moving files more efficient and tamper-proof relative to the current system being used, it can also help to gauge workers’ performance and help institutionalise accountability by virtue of its time stamping features. One of the most straightforward measures the government can take is to mandate its deployment in all government ministries and departments. There are several critically significant databases and systems that can be tapped to improve governance. The Pakistan Bureau of Statistics is digitising census blocks and is conducting a digital mapping of ‘Points of Interests’. Capability also exists to link this with a decision support system. Linking information to accountability systems and decision-making, if appropriately tapped, could be transformational for governance and public service delivery enhancement. This important evidence engine should be optimally tapped. Systems also exist for electronic public expenditure tracking and procurement, as well as inventory and wage management, which can help ingrain transparency. Effective use and triangulation of information from various existing data systems can enhance transparency in the use of public resources. For example, data at revenue-collecting organisations, when triangulated with Nadra data and other government information repositories, can help identify tax evaders. Effective use of existing instruments of governance alone can yield enormous benefit. These four practical policy decisions can be adopted today, without any need for significant resource allocations. Though not sufficient, these are necessary initial steps without which there could be little progress in the overall scheme of anticorruption reform. The government should consider adopting these to signal their commitment to anticorruption reform. Part I of this article appeared on January 7. February 11, 2014: Cancer is a leading cause of death, which accounts for 7.6 million deaths, worldwide. Hence, each year the world celebrates World Cancer Day on February 04, 2014 to raise awareness about the disease. On that day, Heartfile shared a sobering reminder about the devastation cancer causes at the individual and systems level, with the concluding punch line “Let us at least recognize the magnitude of the problem and pay tribute to those braving cancers and others serious conditions on World Cancer Day while we continue with our struggle to fight health systems challenges and raise awareness about prevention”. The post is available on our Heartfile eForum and was also cross posted on the Huffington Post. Your comments are welcome through the eForum discussion portal.